The official report of the Nanavati Commission of the Government of India on the 1984 anti-Sikh riots found ‘credible evidence’ against Tytler, saying he ‘very probably’ had a hand in organising the attacks. The Indian government, however, decided not to prosecute Jagdish Tytler due to lack of concrete evidence. 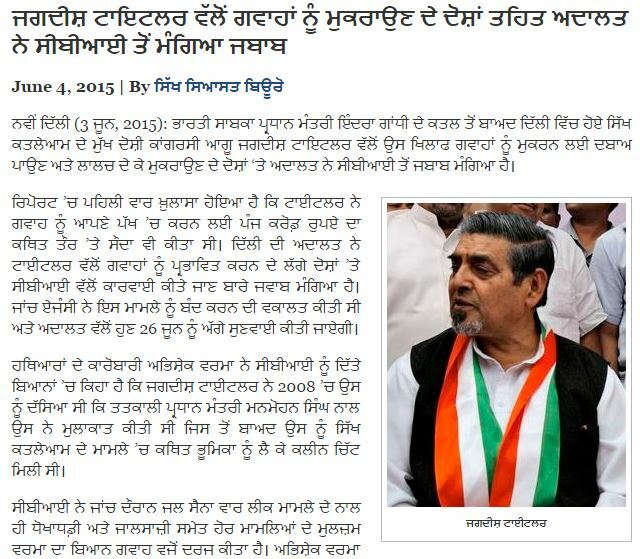 Tytler claimed innocence, and maintained that it was a case of mistaken identity. 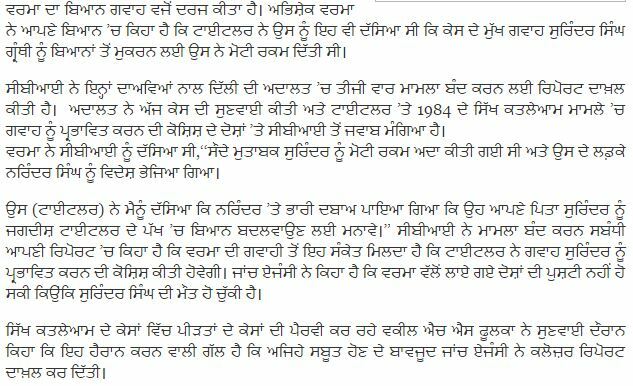 Tytler had not been named by eight earlier inquiry commissions set up to investigate the 1984 anti-Sikh riots. On August 10, 2005, his resignation from the Union Council of Ministers was accepted by the President of India on the recommendation of Prime Minister of India, Manmohan Singh. On April, 2004 the Indian National Congress Party announced Sajjan Kumar, Jagdish Tytler, R. K. Anand and others allegedly involved in the anti-Sikh riots, as its candidates for Indian Parliament elections for constituencies in and around Delhi. Sajjan Kumar, R. K. Anand, Darshan Sharstri and H.K.L. Bhagat were accused by several independent commissions of inquiry of being complicit in the riots, including the People’s Union for Civil Liberties, the People’s Union for Democratic Rights and the Citizen’s Justice Committee.